As THE CRIMSON CORSET nears availability as a paperback, I’d like to share the foreword, written by my friend, my collaborator, my favorite author, Tamara Thorne, whose books I’ve adored since my teen years when I never could have imagined I would ever meet her, let alone one day write books with her. I can think of no better way to be introduced into the world of writing than by horror-lit royalty like Tamara Thorne. She has published so many books that I love, and have loved, for so many years, and to hear her praise my work is, in itself, a dream come true. “Alistair Cross is a hell of a good writer, and I’m not just saying that because he’s the collaborator of my dreams. It’s because I’ve read the novel you now hold in your hands half a dozen times – from first draft through final edit – and with each read, it just kept getting better, addicting me more and more to its gripping – and at times, eye-popping – plot. The characters are lucid and sublimely alive as they take Alistair’s story and run with it, delivering strong doses of excitement, terror, humor, and sexuality. His dialogue shines; I can hear his characters so clearly it’s as if I’m eavesdropping … and it’s a juicy conversation. The Colter Brothers, Cade and Brooks, are hunky, hilarious, and a pleasure to get to know. They could be your next door neighbors (if you’re lucky!) but as they face their demons, they teach us so much about growth, about confronting adversity, and about the nature of the human spirit that it would be impossible to write them off as mere entertainers. Watching these brothers develop, watching how they argue, joke, and then work together is not only delightful, it’s inspiring. Theirs is a bromance worthy of Sam and Dean Winchester’s and this adds a fascinating layer to an already riveting piece of fiction. And then there’s the sheriff, Ethan Hunter. While so many of his kind are stereotypical, Ethan has strengths, weaknesses, amusing quirks – and some very interesting hobbies – that deliver him from the trenches of mediocrity and place him under a spotlight of his own. Ethan is more than a means of moving the plot forward and relaying information – he’s a man with a story. And it’s the kind of story that will keep you up at night. At Eudemonia, a pricey and beautiful health spa, lives the messianic Michael, leader of the peaceful faction of vampires. Michael is in equal parts magnetic and mysterious – a thoroughly fascinating figure even without Reaper, the movie-quoting raven on his shoulder. Through Michael’s eyes, we see a world that is never sullied, never without hope – a world in which we’d all love to spend some time. Perhaps less blinded by idealism is Winter, his second-in-command, and slightly medieval buddy. This guy is the kind of fearless grinning sidekick any leader would be glad to have, and together, Michael and Winter are a compelling force capable of making any villain flinch. 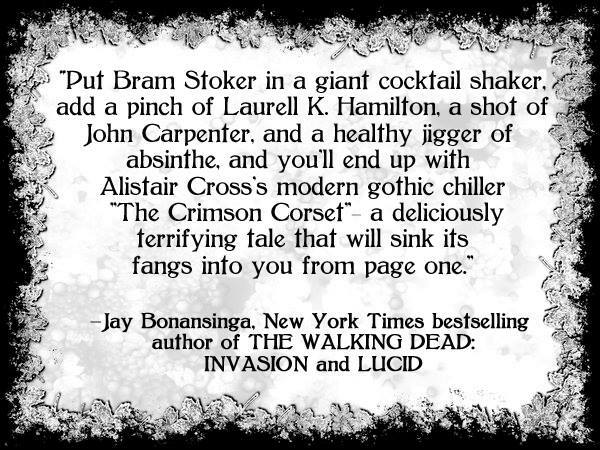 Which brings us to the bad guys – the vampires of the Crimson Corset, a notorious nightclub at the other end of town. Its inhabitants are complete well-rounded characters with intrigues of their own. There’s my personal favorite, the psychotic and beautiful little leader, Gretchen VanTreese, who’s never met a man she didn’t want to dominate. We are also treated to her lieutenant, Jazminka of the thigh-high boots, questionable sexuality, and thick Slavic accent she hasn’t lost in 200 years. Then there’s Aidan and Ambrose, the beautiful twin boys that Gretchen keeps as pets – but these guys have nothing on her favorite plaything of all, her bodyguard Scythe, whose anatomy is so impressive she calls it Vlad the Impaler. As an added treat, there are several cameos by vampires from my own novel, Candle Bay. When Alistair asked if they could stop by The Crimson Corset, I was surprised and pleased. And he wrote them like a boss. He understood my guys completely and put exactly the right words in their mouths. I was so impressed I asked him to collaborate on my sequel to Candle Bay. He agreed, and we intend to release it sometime in 2016, so you’ll get another dose of the Crimson Cove vamps as they join the fanged ones of Candle Bay on a very special road trip. As for Mr. Cross, the writer: He always delivers. Failure is not an option. Writing with him – or watching him write a solo in our virtual office – is a study in inspiration. He meets every deadline and makes sure we reach our individual and collaborative goals. He takes his job seriously, makes no excuses, and has the grit and determination to make things happen. And his prose is absolutely beautiful. What a combination! Check out THE CRIMSON CORSET, hanging out with Louis, Laurell, and Lestat at no. 27 on Amazon! THE CRIMSON CORSET is AVAILABLE NOW! Just click the pic for your copy! And listen to a live radio interview at Dellani’s Tea Time. Sheltered by ancient redwoods, overlooking the California coast, the cozy village of Crimson Cove has it all: sophisticated retreats, fine dining, and a notorious nightclub, The Crimson Corset. It seems like a perfect place to relax and get close to nature. But not everything in Crimson Cove is natural. The streets are running red with blood, and as violence and murder ravage the night, Cade must face the darkest forces inside himself, perhaps even abandon his own humanity, in order to protect what he loves.